PRODUCT DESCRIPTION: Tropiclean Oxy Med Itch Relief Spray is formulated with oatmeal, vitamin B5, and vitamin E to relieve itching and soothe dry, flaky, irritated skin. No-sting formula contains no steroids or alcohol. Contains Bitrix to discourage wound biting for faster healing. Great for "hot spots," flea bite dermatitis, eczema, seborrhea, and scaling. 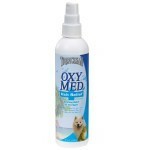 Tropiclean Oxy Med Itch Relief comes in an 8 oz pump spray. RELATED PRODUCTS FOR THE PET: FLEA COMB MELALEUCA SHAMPOO WATER BASED (GENTLE) PERMETHRIN PET SPRAY PETCOR (alcohol based – strongest pet spray available – KILLS FLEA EGGS!!) TRIPLE PYRETHRIN PET SHAMPOO (great smelling and very effective) FLEA DIP CONCENTRATE FLEA POWDER (for treating dogs and cats).